Sacha inchi (Plukenetia volubilis) is a plant that produces large, edible seeds rich in omega-3 and omega-6 fatty acids, protein, and other substances such as vitamin E and beta-sitosterol. Native to Peru, sacha inchi is also known as sacha peanut, jungle peanut, or Inca peanut. Sacha inchi oil has a similar fatty acid composition to flaxseed oil. It is a rich source of alpha-linolenic acid, a plant-based omega-3 fatty acid, and is also high in linoleic acid (an omega-6 fatty acid). A study published in the Journal of Agricultural and Food Chemistry in 2002 found that sacha inchi powder is unusually high in tryptophan, an amino acid essential to the production of serotonin (a nervous system chemical involved in regulating appetite). The nutrient-dense whole seeds are often consumed roasted. The ground seeds are available in protein powder, cereal, and other food products. The pressed oil from the seeds is used in cooking or is found in dietary supplements. Sacha inchi have a nut-like flavor when toasted and can be eaten as a snack or added to a variety of dishes. Rich in omega-3s and protein, it is often consumed by people following a vegetarian or vegan diet. Often marketed as a "superfood", sacha inchi is said to offer a variety of benefits. Some proponents suggest that consuming sacha inchi can help reduce excess abdominal fat and promote weight loss. In addition, sacha inchi is purported to fight depression, reduce cholesterol levels, prevent heart disease and aid in diabetes management. Applied topically, the oil is used for skin and hair in face oil, face cream, or hair oil. Preliminary research indicates that sacha inchi may be of some benefit to people with elevated cholesterol levels. For a pilot study published in the Peruvian journal Revista Peruana de Medicina Experimental y Salud Pública in 2011, researchers assigned 24 people with high cholesterol to four months of treatment with varying doses of sacha inchi oil. Although results revealed that sacha inchi oil appeared to have beneficial effects on cholesterol levels, the study's authors noted that more research needs to be conducted in order to evaluate the efficacy and safety of sacha inchi. In another small study, adults took 10 or 15 mL of sacha inchi (rich in alpha-linolenic acid) or sunflower oil (rich in linoleic acid) daily for four months. At the study's end, total cholesterol, LDL cholesterol, and blood pressure were lowered with both sacha inchi and sunflower oils. Those who took sacha inchi oil had higher HDL cholesterol levels at four months. The most frequent side effect of both oils was nausea, which lessened over time. While roasted sacha inchi seeds are generally considered safe for most people when consumed in small amounts as a food, little is known about the effects of regular or long-term consumption of sacha inchi in supplement form. Sacha inchi oil may cause side effects such as nausea and elevated HDL cholesterol. Allergic reactions to sachi inchi have been known to occur. Since sacha inchi powder has been found to be rich in tryptophan, it may interact with supplements or medications that increase tryptophan and/or serotonin (such as antidepressants) and raise the risk of serotonin syndrome (a rare but serious condition). Raw sacha inchi seeds and leaves contain naturally-occurring plant toxins, such as alkaloids and saponins. According to one study, "high and chronic consumption of fresh seeds and leaves should be avoided." The study's authors recommend heat processing (such as roasting the seeds) in order to reduce the amount of toxins and health risks. 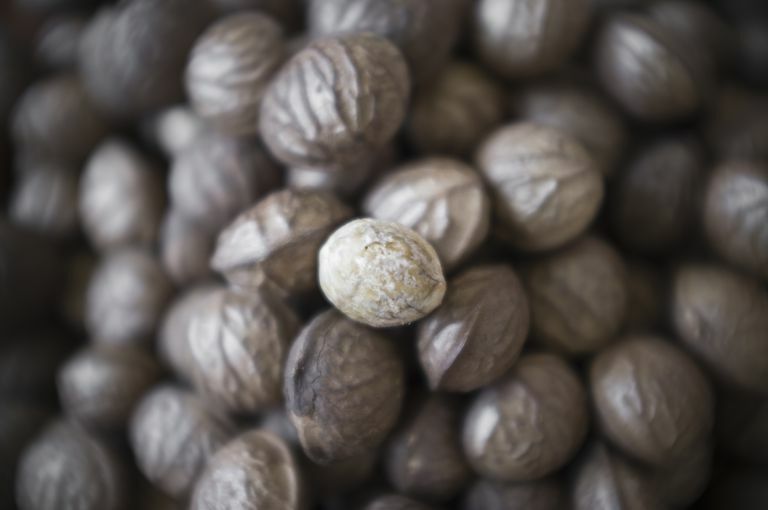 Although it's too soon to recommend sacha inchi as a treatment for any health condition, it's possible that eating the roasted sacha inchi seeds or oil as part of a balanced diet may help enhance your overall health. While sacha inchi may help increase your intake of omega-3 fatty acids, alpha-linolenic acid must be converted by the body to eicosapentaenoic acid (EPA) and docosahexaenoic acid (DHA). Foods that are rich in DHA and EPA include oily fish like salmon, tuna, sardines, and herring. If you're considering taking a sacha inchi supplement, be sure to consult your doctor first to discuss whether it's right for you. Fanali C, Dugo L, Cacciola F, et al. Chemical characterization of Sacha Inchi (Plukenetia volubilis L.) oil. J Agric Food Chem. 2011;59(24):13043-9. Garmendia F, Pando R, Ronceros G. Effect of sacha inchi oil (plukenetia volúbilis l) on the lipid profile of patients with hyperlipoproteinemia. Rev Peru Med Exp Salud Publica. 2011 Dec;28(4):628-32. Gonzales GF, Gonzales C.A randomized, double-blind placebo-controlled study on acceptability, safety and efficacy of oral administration of sacha inchi oil (Plukenetia volubilis L.) in adult human subjects.Food Chem Toxicol. 2014 Mar;65:168-76. Sathe SK, Hamaker BR, Sze-Tao KW, Venkatachalam M. Isolation, purification, and biochemical characterization of a novel water soluble protein from Inca peanut (Plukenetia volubilis L.). J Agric Food Chem. 2002 Aug 14;50(17):4906-8. Gonzales GF, Gonzales C. A randomized, double-blind placebo-controlled study on acceptability, safety and efficacy of oral administration of sacha inchi oil (Plukenetia volubilis L.) in adult human subjects. Food Chem Toxicol. 2014;65:168-76.